I hope you are happily enjoying time with friends and family. As this year fades and the new one begins to twinkle to life I'd like to say thank you for being with me this year and I look forward to another year of sharing a love of all things creative with you. I have been overwhelmed with a flow of inspiration this past week. I see this as my own creative spring plopped right into the middle of winter. 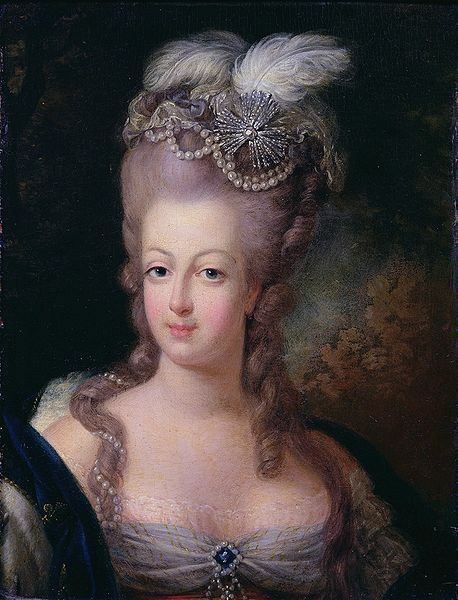 Unicorns, fairies, Marie Antoinette... are just a few of the characters frolicking about in my noggin. I can't wait to let them spill onto my paper and into my shop. I hope you're making lots of special Holiday memories with friends and family. 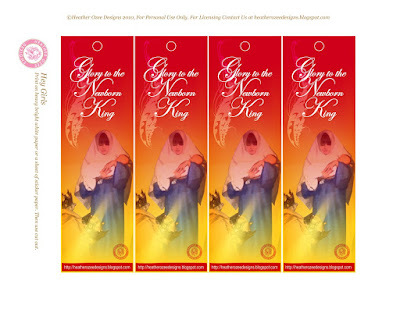 Here are some free bookmarks for you to use Non-Commercially. Feel free to print them on card stock and hand them out at your child's class or church or just stick one in your favorite book. 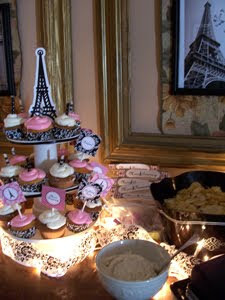 I have a sweet customer who sent photos of her lovely Paris Party. Kerstin did an amazing job decorating and I love color coordinated candy! Here are just a few of the pictures. To see more and read her fun blog, The Real Housewives of Idaho click here. Thank you Kerstin for sharing your little one's special day. All of these fantastic photos were taken by Kerstin. I've been crazy busy these days. Work, Christmas Plays, and all the normal life stuff. But I wanted to take a moment to share a little peek into our home. We love decking the halls! This antique Santa cup was my mothers. I created the paintings above the buffet a few years ago. 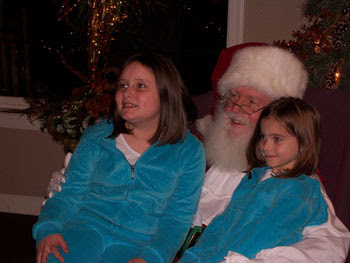 They have my girls names on the list to Santa. The buffet was my Great Grandmother Harmon's. 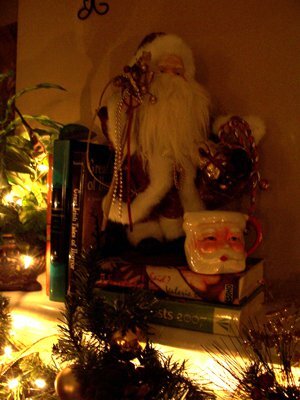 This Santa figurine was my grandmothers. 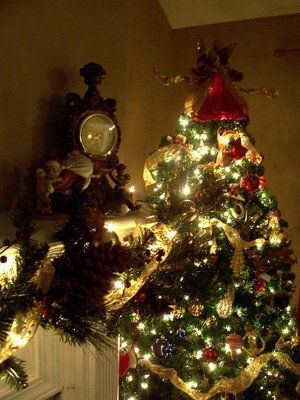 Our tree is filled with ornaments that were gifts or made by myself, my girls, my mother and my grandmother. And that beautiful wreath was made especially for me by a dear friend. 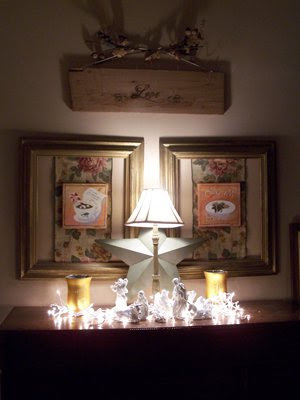 I'd love to see how you deck your halls! I've been having a blast designing a Holiday Snow Party Kit and my Christmas Games Party Pack. These sets are just what you need to take a great party to "Look Out Martha" fabulousness! The games and paper dolls in the Christmas Games Party Pack are perfect for your child's class party or family get together. There are snow man, ginger bread and Santa paper dolls. 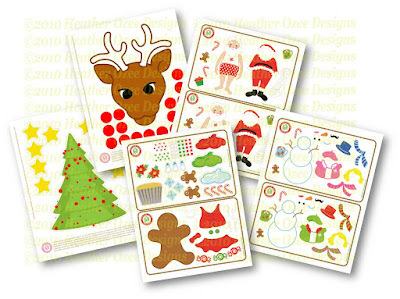 It also includes a cupcake decorating sheet along with Pin the Nose on the Reindeer and Pin the Star on the Christmas Tree game. Time for Sugar plumb fairies to dance in my head. Sweet Dreams! I hope you all had a merry time doing your Black Friday shopping. My friends and I were on the streets by 3 AM and in the stores by 4:00. We had a ball. I was looking back at old photos of my girls and thinking how quickly they grow. It seems like yesterday that we were in changing diapers and running after toddlers, and now I have a tween and one that thinks she's twenty! I've been busy planning Thursday's meal, hosting bible study at our home, working on an exciting project for Coca-Cola that involves a certain Square in New York, and of course just being a Mom. Of course the last is my favorite thing! I'll share more as I can on the Coca-Cola project. But, it's pretty hush hush. I wanted to give you all a couple of Freebies to use this Holiday Season. My treat to say Thank You for your business and in many cases dear friendships. 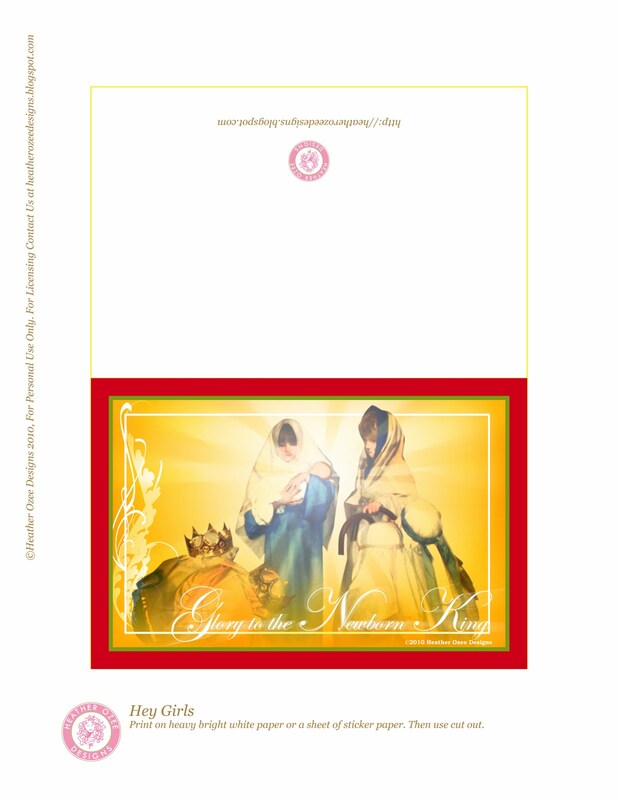 I've included a Free Christmas Card and bookmarks. Simply click onto each one to enlarge and then print onto card stock and cut out. I hope you all have a Blessed Thanksgiving and that as we enter the Christmas Season we all remember that Jesus is The Reason for The Season! My oldest turned 10 today. She chose a very special present this year. A tween's dream come true, a Parisian Bedroom. 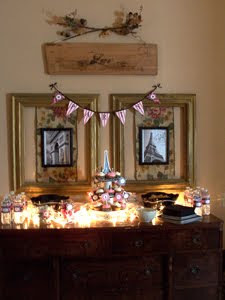 I'll share pictures of the room soon, but today I wanted to show off her party decor. We matched the pink to the color of her new pinker than pink walls. The invitations and all the other party favors featured bits of French here and there. 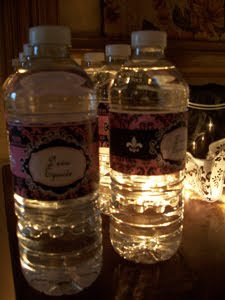 What party would be complete with out customized water bottle labels? We even had our own little Eiffel Tower atop the cup cake stand. For the pictures above the Desert buffet I simply found public domain images online and then printed them in black and white. Add a couple of Dollar Tree $1.00 picture frames and... magnifique! The cupcakes were made from boxed cake mix plus some snappy food color work. And the peppermint Malted Milk Balls added the little pink speckles I needed. 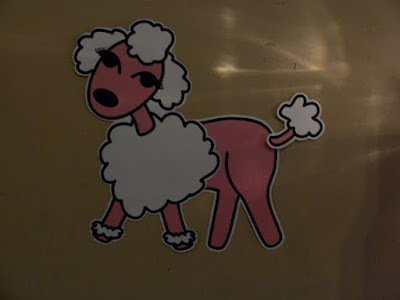 I also designed a Pin The Tail on The Poodle for the younger crowds. Printing prices very depending on where you live, but for me to print all the stuff you see here, plus some, most of which was on card stock, cost only $13.00 at my local print shop. In my opinion, that's a deal! Just add some swank square black paper plates from Target or Wal-Mart and you're done. If you're interested in buying this set or seeing the other party sets I have available click here. I've been busy whipping up some new fun holiday items for my etsy shop. My shop will be offering a variety of Christmas party packs, including one that's especially close to my heart, The Faithful. It's Christ centered. I'll be posting those soon. I'm also working on Pilgrim paper dolls for Thanks giving and some Christmas paper dolls that are a hoot! 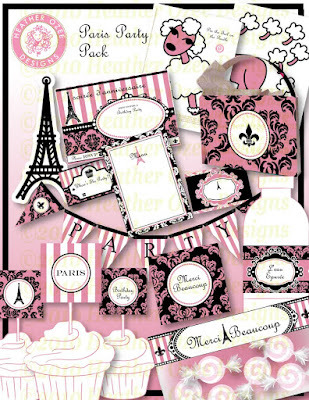 My oldest Roxy will be celebrating her 10Th birthday soon and has her mommy creating a birthday pack fit for any Parisian girl! It will be available soon. I forgot to mention that a new paper doll hatched this weekend. Meet Frankin. 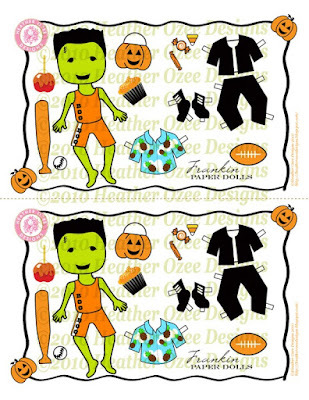 He's a cute little green guy who loves his Hawaiin shirt and foot ball. You can pick up Frankin and his friends here. Lauren had posted the Make It Monday AND a Giveaway!! 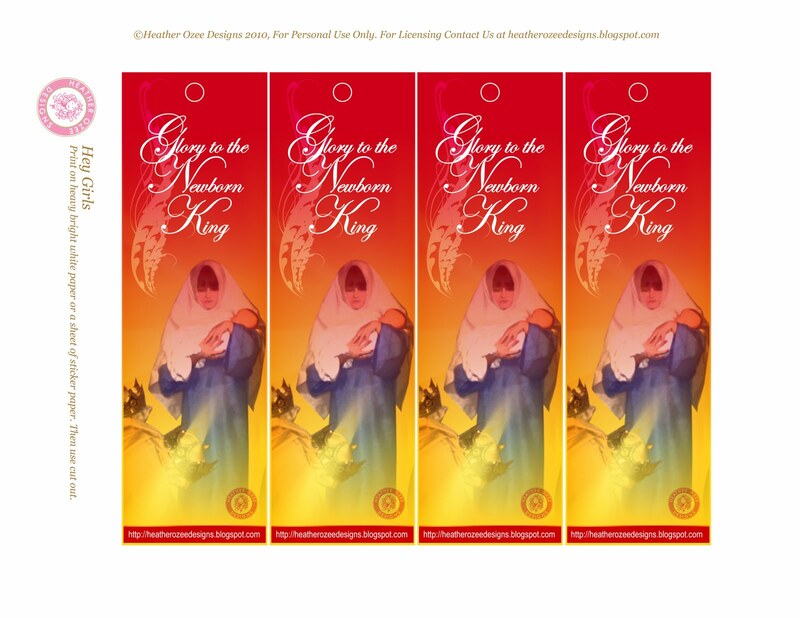 If you'd like to enter a chance to win your choice of a printable design by me go to her blog. All the details of how to enter are there. Have a super day! and enjoy this picture of Lauren's sweet little girl playing with one of my fall paper dolls! It's been crazy around here lately. 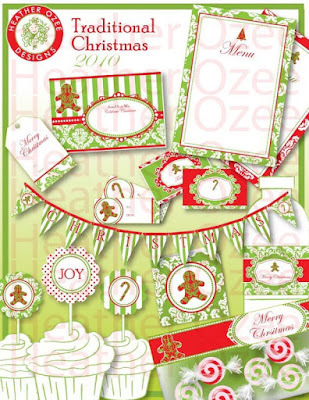 I've been working on the Christmas Collections along with the normal craziness life as a working mom presents. 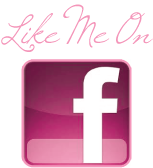 But I wanted to take a moment to drop a note about an upcoming Give Away I'm teaming up with Show Me How You Do That. So keep watching for your chance to win. What might you ask will you be entering to win? 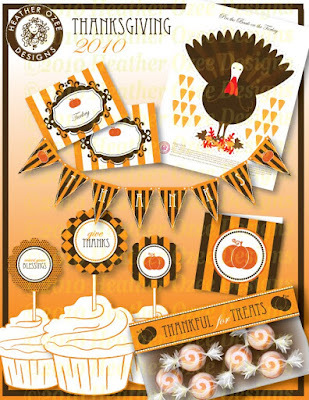 The 2010 Thanksgiving Printable Party Kit! After a fun day wandering our lovely town square on a historical ghost tour I hurried home to do what? 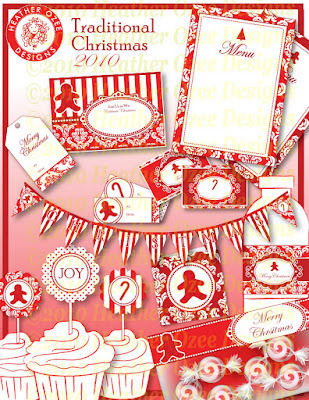 Design Christmas stuff of course! I'll be offering several Christmas Party Packages this year. The first one, which is now available in my shop, is the Traditional Set. Filled with lovely damask and rich red tones. 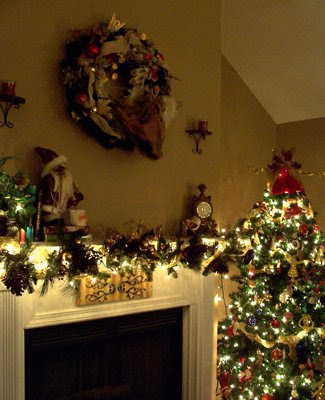 Gingerbread Men, Candy Canes and Christmas Trees are all set amid a pleasant array of patterns. 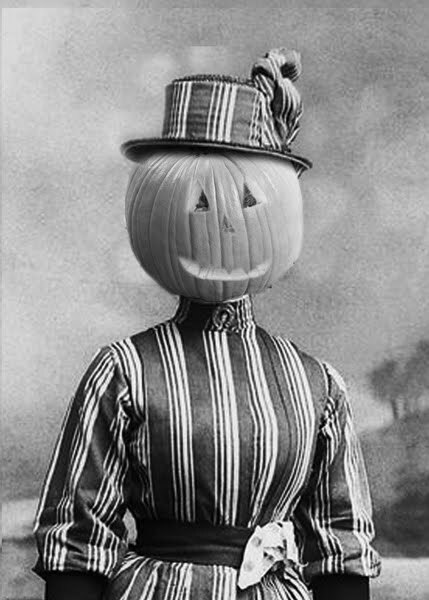 So, Ti's the Season to get Spooked... but this art girl's ready to get her jingle bells ringing! (or a jolly one if your on the Heather Calendar)! It's almost that time. The time when you hear little giggles from ghosts and goblins on your porch with out stretched hands and sticky faces. We're about halfway there. 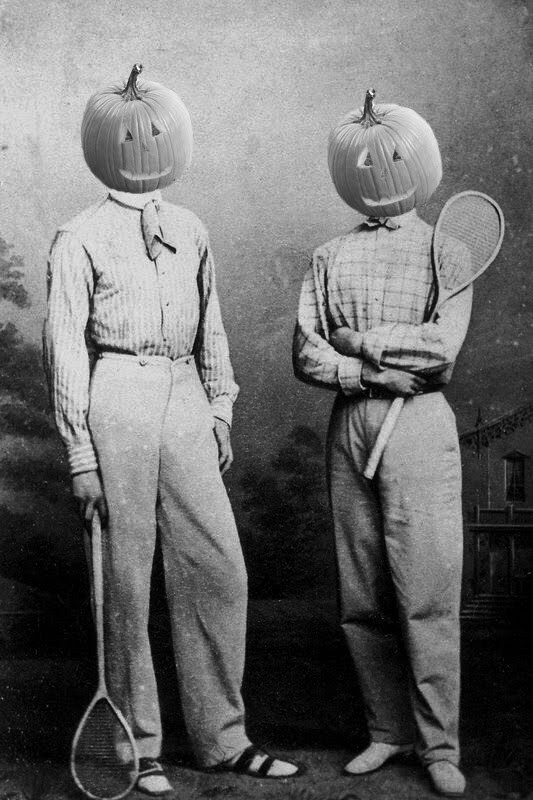 We still need to get or make costumes. 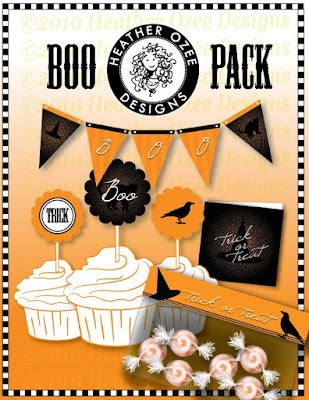 Don't forget to place your order for the Halloween Party Pack in my etsy shop. 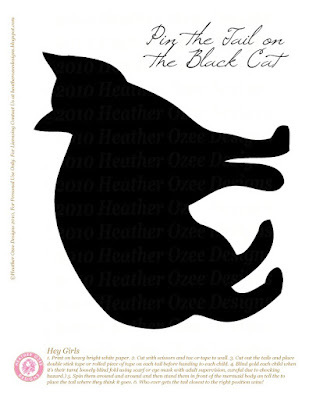 There's lots of fun to be had with a pin the tail on the black cat too! I've been pulling together a few pieces of art for a last minute art show this morning. While I was rummaging through old art an overwhelming urge to create a Silhouette hit me. 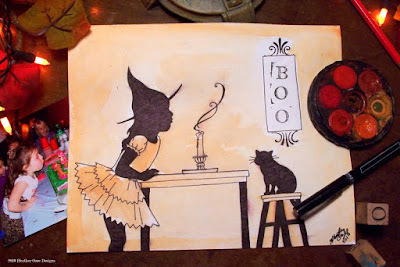 That combined with the Halloween season we're upon made for a fun little pen and ink with a wash of orange watercolor. 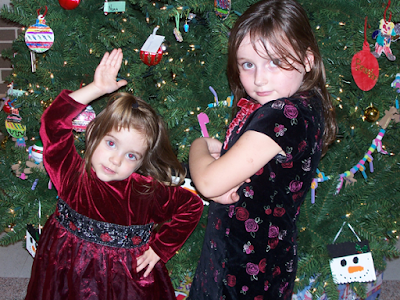 My starting point was a photo of my oldest on her 6th birthday. I can hardly believe she's about to turn 10! What's the most creative decoration you've made for Halloween? I love putting on Halloween Town on the TV and getting creative with the kids this time of year. And I've been known to get a little holiday nuts at the office with Photoshop. 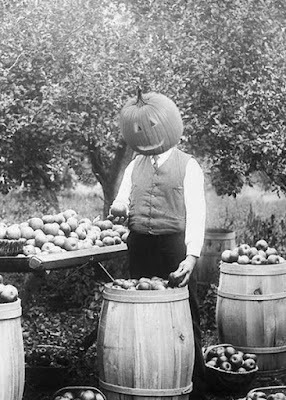 Victorian images and pumpkins, need I say more? It screamed... "off with their heads!" . My mother's response was to come over less frequently. She was a little chicken with those pumpkin heads frames over my buffet. I have no idea why. I'm partial to grabbing a slab of air dry clay and shaping it into whatever ghost, ghoul or pumpkin is fluttering in my manic brain. The year I found one of my favorite folk artist, Catherine Holman, I was so inspired by her work I sat down and painted a haunted version of a house. 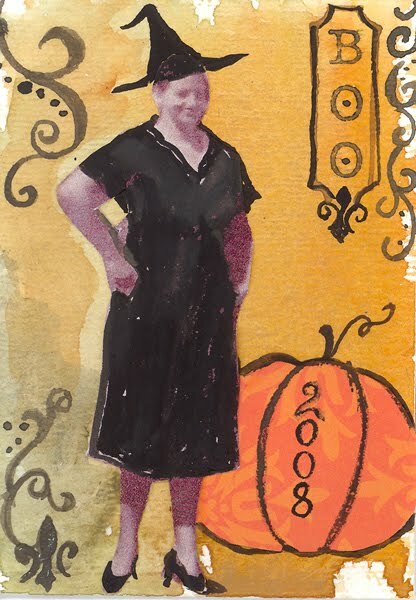 I had fun making an artist trading card with an image of my great grandmother. I turned her into a witch. My mother of course told me that Grandma Harmon was going to haunt me for that. So all these past projects made me wonder, what do other people do to feather their nest around this time of year? 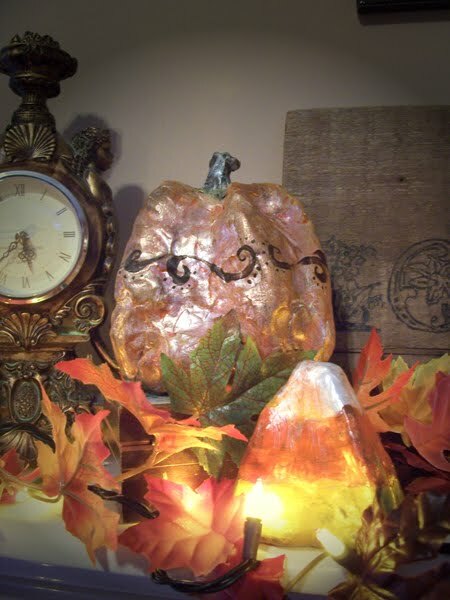 I went nuts over a super cool pumpkin tutorial I found at Smilemonsters blog. This lady went to town with a drier vent, paint and primer. Added some twigs and leaves and in the end was the proud owner of an amazing pumpkin! I give her two thumbs up.... and two toes! 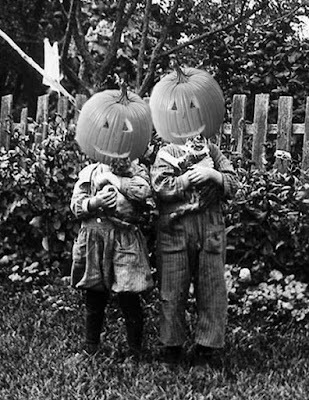 So leave me a comment with your spooky best!